It seems that a lot of super heroes are going back to school nowadays. DC Kids has the Tiny Titans in grade school while last year we saw Supergirl have a few cosmic adventures in eighth grade (let's have that sequel already! 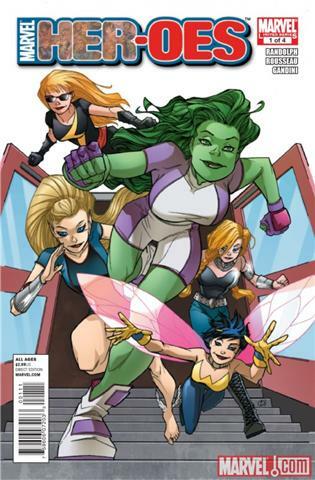 ), Marvel has been enrolling its characters in high school for its all-ages line, and the latest title to graduate to comic shop shelves is HER-OES, a four-issue series written by Grace Randolph and pencilled by Craig Rousseau. Although the cover shows five female superheroes in costume bursting through the front doors of their high school, you will not see teenage versions of the Avengers share math class with the Fantastic Four here. As in the regular Marvel continuity, our heroes (or perhaps I should write 'her-oes') exist incognito from the general public, and from each other. This is readily apparent when we see Janet Van Dyne secretly abandon her bicycle before shrinking and flying like a wasp to school. Janet is the primary focus of this issue as she overcomes her hesitation to be "less talk and more action" by volunteering to design costumes for the school play and initiating a conversation with Wade Cooper, a cute boy she has admired from a distance. Janet achieves the latter after overhearing Namora - the foreign exchange diva and romantic rival - bribe Wade’s younger sister to find out what his favorite college basketball team is. Puzzled and upset by Janet’s sudden intelligence coup, Namora confronts Janet in the secluded backstage of the school theatre. After a heated exchange the issue ends with Janet discovering her ability to shoot energy bursts and that Namora is strong enough to lift a large metal cabinet that is about to be dropped on top of her. Janet and Namora are not the only her-oes we see in this issue, Carol Danvers makes a headless cameo in one panel and Jennifer Walters is introduced as Janet’s tranquil best friend who works at the school library. Although featured prominently on the cover, She-Hulk (who is the reason I bought this title) does not appear in this issue. Rather, we see Jen become greatly agitated and suddenly leave in a huff after expelling Namora and her followers from the library on overhearing them share malicious words about herself and Janet. As a librarian who also worked at my high school library years ago, it would tickle my fancy if we see Jen "hulk out" after someone turns in a book late or damaged. Why and when Jen finally transforms is enough for me to eagerly await issue #2. Her-oes #1 is an enjoyable read with a promising storyline that does a good job of gradually introducing familiar Marvel characters and their abilities in a high school setting, without making it feel like Marvel 90210. The dialogue conveys well, without profanity or sexual undertones, the anxiety and aspirations high school kids express towards one another. The artwork is colourful, if a bit toned down, with the facial expressions and background details pleasant to look at. Eugene Liptak is a librarian and author of Office of Strategic Services 1942-45. The World War II Origins of the CIA, available now from Osprey Publishing. I considered picking this up for my daughter, but at 5 I don't want her to be reading about super heroes fighting over boys. She'd be bored without the ladies in costume anyway! I got this for the oldest supergirl at home (age 11) and she seemed to like it. It seemed to lack a little bit of the warm magic that Cosmic Adventures had. This seemed more 'Mean girls'. I also am a She-hulk fan and thought her working in a library to stay calm was a nice wrinkle. I think i will end up getting the remainder of this and hope it gets more cheery. Is that Valkyrie on the cover? I love Val! Thanks guys, and thank you Mart for allowing me the pleasure to review this issue on your blog. That is indeed Valkyrie on the cover. I did not see her in the issue itself, so I guess she will show up later. "It seemed to lack a little bit of the warm magic that Cosmic Adventures had. This seemed more 'Mean girls'." One difference I saw between Cosmic Adventures and Her-oes was the brightness of their respective pages. Cosmic looks so bright and animated that the characters almost leap off the page, while Her-oes looked toned down for some reason. Her-oes does help fill the void for those still waiting for a Cosmic sequel. I do hope that it is successful not only because its a fun and enjoyable comic, but it will convince DC that there is still a market for "all ages" titles above the elementary school level.